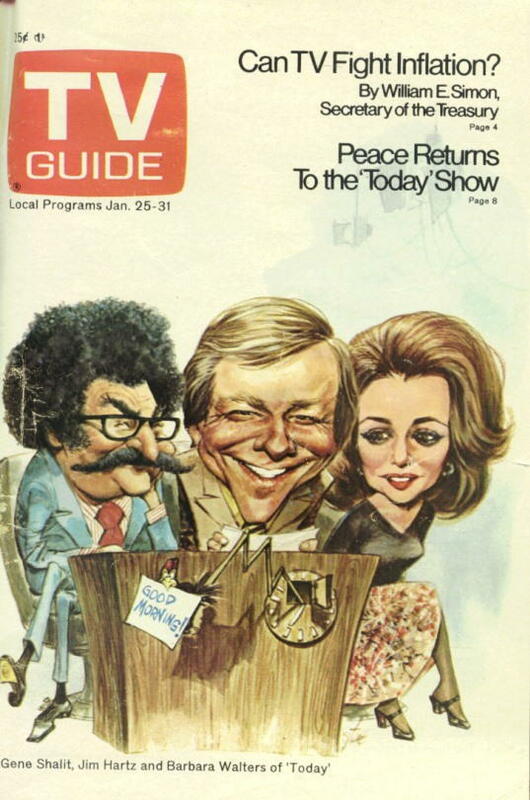 1/6/2007: NBC's "Today" celebrates its 55th birthday next week. The program will spotlight a different decade each day: the 50s on Monday, 60s on Tuesday, etc. Watch for Jim on Wednesday, 1/10. A warm welcome to Jim Hartz! 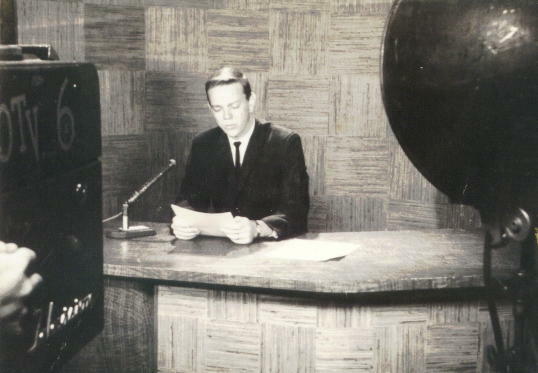 Jim got his start as a news reporter on Channel 6's "Sun Up" in the early 60s, and became 6's news anchor/news director. 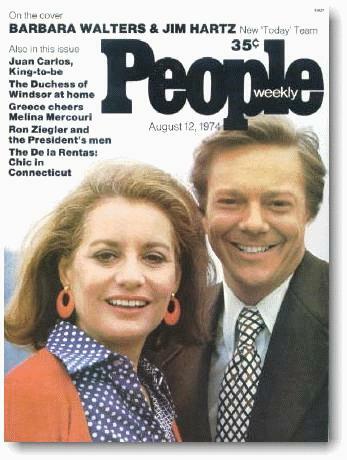 He moved to NBC's New York City flagship station in 1964, where he co-anchored the news for ten years. 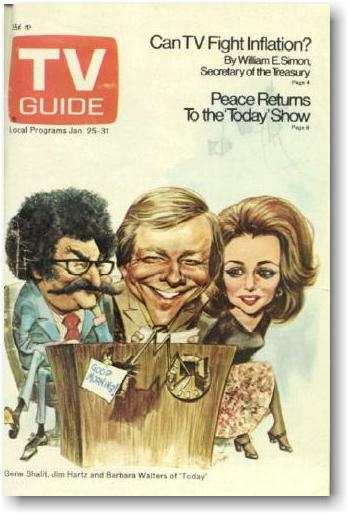 He was then tapped to co-host NBC's "Today Show" for three years in the mid-70s. 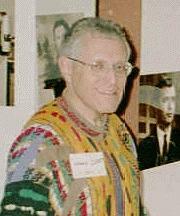 Jim is also noted for hosting "Over Easy" on PBS with Mary Martin. 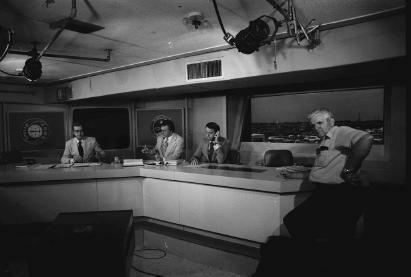 In 1979, another Tulsa newsman, Forrest Brokaw, handled national promotion for "Over Easy"; the show was in a virtual tie for first place among PBS programs. Attached is the press clipping from the Tulsa World when I was hired by NBC in NYC. This was March 1964. George Stevens asked me who I thought might be a good replacement when I left. I recall mentioning Clayton Vaughn and Bob Brown, and he eventually hired both of them. I still see Bob now and then in NYC, and he is doing fine. I haven't had a chance to talk with Clayton in quite a while. 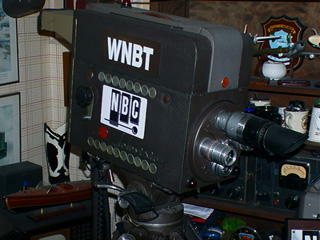 I actually have this equipment...the camera is just like the one I shot the Hartz audition for NBC at KOTV. 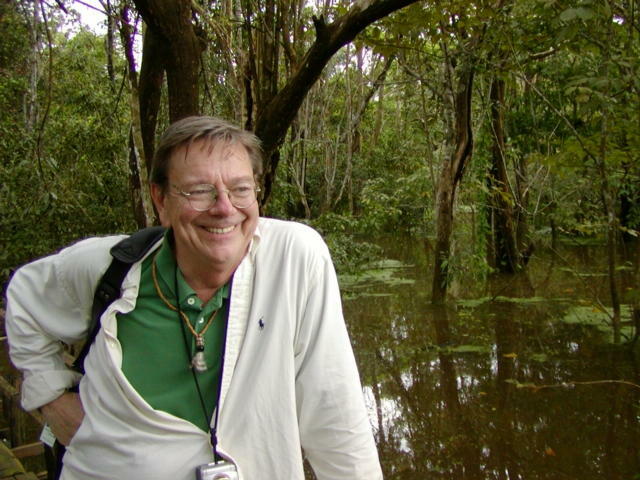 Webmaster, 2/17/2007: I am sorry to report that Robert "Skip" Jennings passed away last week. Read more from Mr. Jennings in GroupBlog 233. One of the greatest television news photographers to come out of Oklahoma, Pat O'Dell, will be inducted tomorrow in the Oklahoma Journalism Hall of Fame. in the Oklahoma Journalism Hall of Fame. Article: "Jim Hartz: Among the Stars"
Jim Hartz at NewsCenter 4, WNBC, New York, tossing to Jim Van Sickle. Maybe you missed this startling Nixon bulletin in 1974. Speaking of Jim Hartz - former Tulsa KOTV, long-time NBC Space Coverage, Today Show, and Washington, DC WRC-TV anchor - he's alive and kicking here in Alexandria, VA and lives about 3 miles away from where I write this. He had a P.R. firm (Hartz/Meek International) and still consults. He was talent at Nostalgia TV - now GoodLife TV - for several years. I first met him there and mentioned our common TU backgrounds. Have enjoyed working with him. 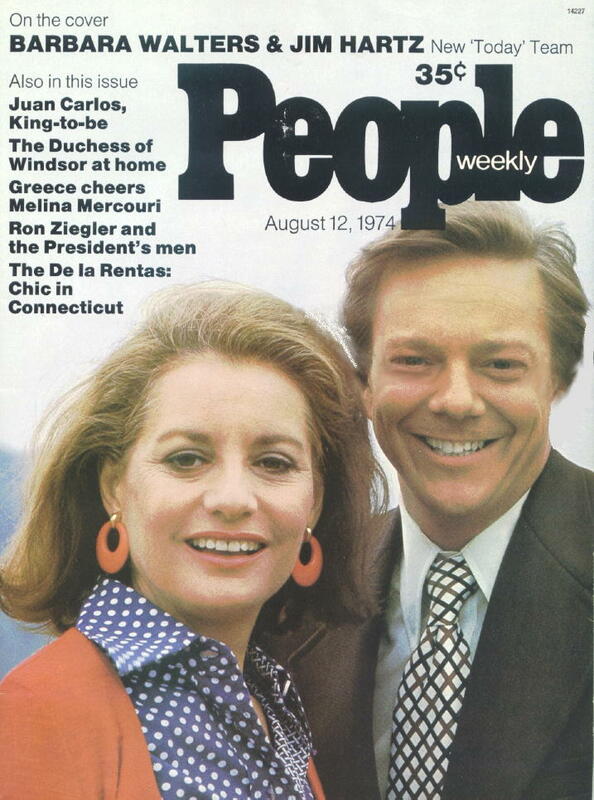 He also spent several years anchoring "Asia Now" for PBS out of Seattle - flying from DC to Seattle but most often Tokyo to anchor with NHK staff several weeks a month. "Asia Now" had producers and reporters all over Asia with cultural news type stories and was on both PBS and foreign outlets. I think someone else took over the anchoring chores, but he has a lot of contacts in that part of the world I guess. The last time I saw him, he said he and his wife loved living here in Old Town in a classic house (I think not far from Katie Couric's). He also shot an episode of the series he did for several years on PBS ("Discover"?) in Alexandria from his Colonial home. I think he is a deacon or warder at the famous church here that George Washington attended. Great guy to work with. Us Tulsans are everywhere! While reading some of the notes about the high school TV shows in Tulsa it dawned on me that the first time I was ever on television came on Channel 8 - a program I think was called Odyssey. This was a University of Tulsa production, supervised by Ed Dumit. Channel 8 donated the time, on Saturday mornings, and the university broadcast/journalism students produced the shows, if my recollection is clear. Maybe Ed can reinforce my memory. On the other hand there are a couple of shows I have been trying to forget for about 40 years. 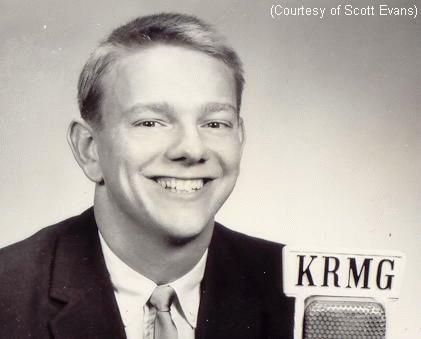 Jim Hartz did indeed gain his first TV experiences at KTUL, Ch. 8, on "Galaxy" ("Odyssey" was almost right, Jim). At the time, he was a pre-med major at TU while announcing on KRMG radio. It was spring of '62, Jim's senior year. Ye gads, almost exactly 40 years ago! I could tell you the dates of his first appearances if it weren't for the fact that my only missing grade book is for that year (weird . . . ). For eighteen seasons, from fall of '57 through spring of '75, KTUL-TV most graciously provided for our students in my Television Fundamentals and Television Production classes (Tom Ledbetter's classes during '68-'69) the opportunity of two semesters of lab experiences once a week in their Lookout Mountain offices and studios. Each week in the fall, our students met with a different executive or department head, who explained the functions and responsibilities of his or her area and answered all questions. In the spring, the main studio, control room, and announcer's booth and Ch. 8's state-of-the-art equipment were turned over to us on Saturday mornings for set-up, dress rehearsal, and LIVE telecast at 11:30 or (after the arrival of videotape equipment) live on tape for airing early Sunday afternoons. Throughout spring, students were rotated through all production positions from floor manager, camera operator, booth announcer, cue card holder, and talent, to technical director and director. While a member of the Ch. 8 studio crew supervised the students in setting up sets and lights and generally stood by in the studio in case of crisis, I put in a lot of mileage racing up and down stairs; but I spent most of the time in the control room, also in case of crisis. During the week preparation took place of diverse programs of the director's choosing, such as plays, jazz and classical music, dance, discussions and documentaries related to the arts, history, political science, business, social issues, etc. 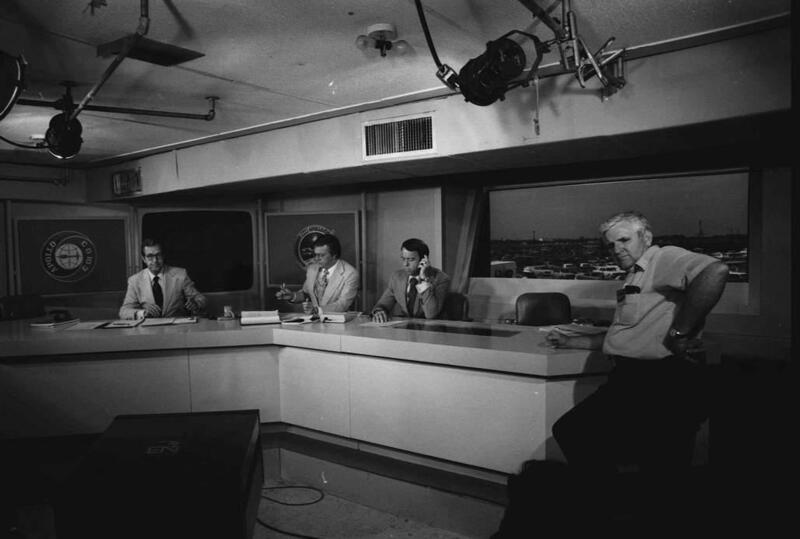 After the first few seasons, the last five minutes became "TU Telenews" as a lab for Bill Hays' Broadcast Newswriting class with student reporters and presenters. Film stories were shot throughout Tulsa. But what an invaluable experience KTUL provided for so many fledgling broadcasters! It would be great to hear from more of you guys through Tulsa TV Memories. This is a real vintage picture. First, it was an early Polaroid. We were experimenting with the cameras for spot news. Didn't work. 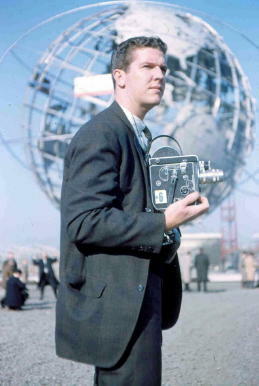 Second, the camera at left is certainly one of the first RCA (can't remember the numbers anymore) b/w acquired by KOTV. The set is just vinyl covered plywood. The microphone is a museum piece. Note, there is no TelePrompter. We had to memorize a lot of the copy in those days in order to keep eye contact. Note also the scoop on the right. We were flooded with light from every angle. My recollection is I have been in only one motion picture. And to confirm that I am probably right, I get a residual check from only one: Power. It starred Richard Gere, Julie Christie, Gene Hackman, Denzel Washington, E.G. Marshall, Fritz Weaver, Kate Capshaw. Sidney Lumet directed it. Anyone would have predicted that a picture with such stars and director would have been a huge hit. Instead, it was a titanic flop. It opened and closed in New York in one week. Another reader mentioned my brother Herb, who was the assistant chief of police in Tulsa. I thank you for remembering him. A drunk driver outside Las Vegas killed him several years ago. Lastly, I will add an addendum to Frank Morrows delightful recollections about the Easter Pageant. I narrated it once. My recollection is not nearly as detailed as his. In fact, I dont even remember the year I did it, much less who played Jesus, etc. I do remember reading it with great feeling by dawns early light. I was speaking into a microphone from inside a school bus turned into a sound studio. I also remember that I had been inside that bus many times before, as the announcer for drag races at Tulsa North Airport on other Sundays. Webmaster: I mentioned to my mom that we had heard from Jim Hartz. She recalled living in a duplex at 710 N. Quaker as a kid/teen. 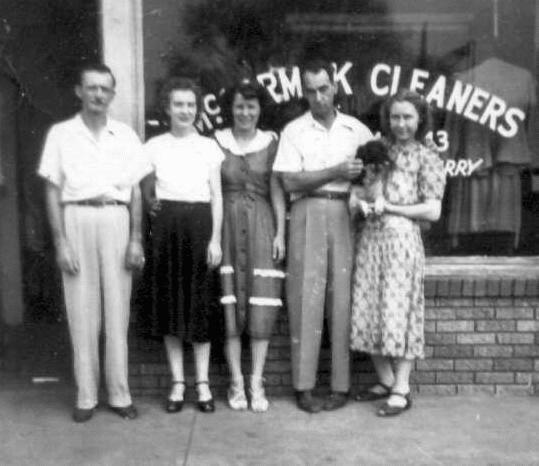 Directly across the street was a church pastored by Jim's dad, who was friends with John and Leona McCormick (right) of McCormick Cleaners, where my grandmother, Elva Enlow Hammond (center) worked for years. Mom remembered Jim as being the youngest in his family, and as a very likable guy. In reference to the recent Shuttle launch, Mike Bruchas wondered where I was. He's right; it has been about 35 years since I covered NASA for NBC. Well not quite. I have been going through a lot of old photos recently and came across the attached. It's a shot of the NBC studio at the Kennedy Space Center. Seated left to right: John Chancellor, me, and Alan Shepard. There is an unidentified stagehand on the right. This was taken on July 15, 1975 just before the launch of the Apollo-Soyuz. This was the last launch I covered for NBC (30 years ago this month), although I reported later from JPL in California on several unmanned missions. Incidentally, the US commander of the joint flight was a fellow Oklahoman, Lt. Gen. Tom Stafford, USAF (Ret.) who has a house only a few blocks from where I now live in Alexandria, Virginia. We've stayed in touch over the years. It's good to see the US is back in the space business and it brought back a lot of warm memories. I have to say how much I enjoyed the Jim Hartz page. While growing up in Tulsa my family lived next door to the Hartz family. Jim was nice enough to invite my now deceased father to New York City and take him backstage to the Tonight Show. Dad talked about that night over and over. Jim was a wonderful neighbor and great friend to my father. I would just like to thank him for the great memories.